Over the years I have taken great interest in Model Trains, however, I always had significant constraints while designing one – size, portability, cost, everything had to be taken into account while being sincere to satisfy my artistic interests. Hence over last over a decade I have designed many model railroad layouts and plans that fit an ‘average’ man’s life. Plans that don’t require a lot of space, can be built easily and expanded with a modular/sectional approach to give the builder clear goals and achievements. Here are some of my selected plans that I have enjoyed drawing and I am sure will be enjoyable to build too. If anyone wishes to use them, I would love to hear about it and will be curious to know how my visions are interpreted. So, you are free to use and modify the below plans – no strings attached, but I would appreciate if you let me know how you are using them. One of my recent ‘bugs’ is the standard gauge logging operation in the Adirondacks during the first half of the 20th century. ‘Logging Railroads of the Adirondacks’ by Bill Gove is a tremendous book – loads of historical information, prototype photos and actual railroad track maps and plans gives a lot of inspiration and options. I have been making various designs that capture the main theme of the region and type of operation, and even planning to make my next personal layout based on that theme. The lifeline of the logging operation in the Adirondacks mountains was primarily the various branches of New York Central. Multiple small, medium and large logging railroads interchanged with New York Central lines in many places. I took this theme and converted it into a few operation based switching layout designs of varying spaces.The version 1 is very much for small spaces. This is an HO scale, standard gauge layout depicting the theme above. The era can be anytime during the first half of 20th century, but I visualized it more during the 1940’s. Note that there is not really any ‘actual’ logging operation shown in this plan, it is focused on depicting one of those numerous junctions along the New York Central lines, and the logging operation happens ‘off the stage’ in the staging yard. A HO scale model train layout plan, with Faller car system roadways. The layout is 9 ft X 25 inches – pretty small for a HO layout and should fit in any average household. The whole layout is broken down in 3 equal sections of 36 inches X 25 inches, plus you would need a staging zone, possibly with sector plates. The turn table is totally optional and can be replaced with just a single stall engine house and the space can be used for added scenery. I have made the roadway to run small Faller Car System vehicles to add a little more action, however, that is very much optional too. Te double slip switches are Tillig ones – they have excellent geometry to provide a lot of flexibility within small space and helps restrict the length to just 9 ft. Someone with a little more space can just replace the double slips with back to back #5 or #6 switches. Operation is standard with both mainline traffic and logging line traffic originating in the staging. It is possible to add short passenger trains in the mainline, however, it is not possible to simulate through passenger train movement – the train has to stop at the station, the loco reverses to the other end of the train and then takes it back to staging – one reason why I kept that turn table in the design so that the steam locomotives can be rotated. Freight on the mainline can be mixed – mostly finished product from the two mills and from the local business, sometimes an odd box car can be spotted at the freight house. In the logging line the inbound train brings loaded log cars for the two mills and take the empties back to staging. This design is the same concept and scale, just in a larger space, thus allowing a small logging section on far left hand part. You also get an over and under action, much longer siding to run longer trains; narrow, long design to give a sense of distance, especially with the long and narrow stretch of the road in the front. It gives an opportunity to create a small town scene and sawmill crew quarters as well. This is an N scale layout and for this design I gave preference to Atlas C55. I wanted to include continuous run with a small staging and a yard, some small industry, one small oil refinery and some over and under action with possibility to run two trains at a time). This is an 8′ X 6′ L Shaped layout. My approach was to build a complete imaginary layout with some lose knot tied to some real world. While searching for the right prototype and a name, I was listening to my favorite Statesboro Blues by Allman Brothers Band, and that’s when it hit me! What about Statesboro Railroad? But a quick online search told me that Savannah and Statesboro RR was decommissioned back in 1950s and all that is left of Statesboro railroad is a small spur now. But I liked the name too much to go back now – so here is the story: What if Statesboro RR survived? Survived till 80s or 90s – the time that we are trying to capture. Online search revealed that modeling an oil refinery near Statesboro will not be too inappropriate. Though the area is primarily coastal and plain land, there are some small hills where I can hide my sharp curves. This consideration gives another advantage – keeping the theme intact with prototype buildings, roads and other artifacts, I can design the railroad the way I want it – because I really don’t have to restrict myself to the exact dimension of the prototype as it was in 1950s – who knows, if the railroad would have survived, it might have looked exactly the way I design it today – 50/60 years is a long time! As you can see -the 8′ wall portion is actually pretty thin, except the loop. Even that has been kept at a minimum depth possible. Smooth, broad curves on the mainline with #10 turnouts and curved turnouts, smaller #7 and #5 in spurs. Long, curved yard giving a unique view of the trains, a long, curved stone viaduct over the yard making the view even more interesting. A large area to model the oil refinery with plenty of detail. Two passing sidings in front of the yard for plenty of action and operations, as well as a big junction type look. There is also enough area to model a small passenger station right in front of the yard if that’s a requirement. The layout will be divided in two 6′ long sections – depth will vary as the tracks take turns on the layout. The only challenge would be the tight loops if longer locos are running – but longer locos can travel a considerable length by bringing cars in to the Statesboro yard directly from Savannah without hitting the tight curves, and going back the same way. Also, if there is any possibility to increase the loop radius to 11″, then most locos in N scale would run pretty good. Traffic will be primarily freight – long train of oil tankers in and out of the refinery, mixed freight from other industries, may be some small container delivery to the large freight terminal, and plenty of opportunity to run a variety of through trains, including short passenger trains. This is a true prototypical design of the exact feature – I personally did the prototype study on site and also took help from documentation available on the web. Of course slight modifications had to be made in the track geometry to fit a shelf layout format. The layout is 10′ X 2′, broken down in two sections of 5′ X 2′ each (the red line in the plan denotes the separator). 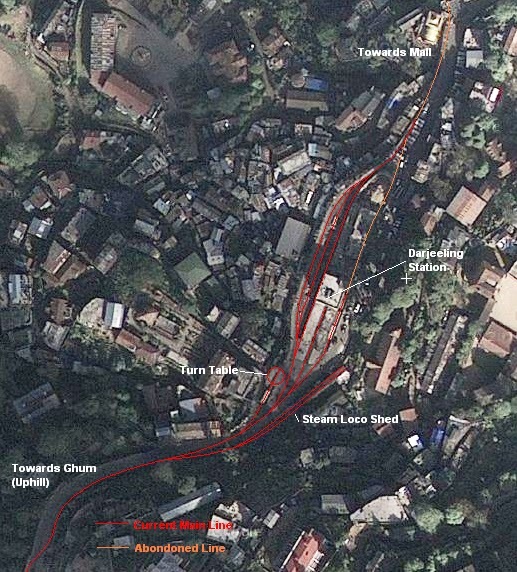 The satellite image shows the actual track arrangement highlighted in red (as studied in 2011). The reason for choosing OO9 is that most number of popular DHR locos and rolling stocks are available in that scale – two notable sources are Backwoods Miniatures and Worsley Works. OO9 locomotives are large enough to install DCC chip, and may be even a small speaker for sound effect. For tracks, there are more flexibility as common N scale tracks can be used with slight modification (rule of thumb is to remove the alternate ties). I have mostly used Peco N scale Code 55 turnouts and tracks – others should work as well. I think the funny title says it all! This design has one fundamental design element, that is a ‘Y’ and is made for a corner. Designed in N scale, this is basically a small switching layout covering 3 square ft. with two additional sections on each side to accompany the scene. There is plenty of opportunity to model different facilities like oil, grain, warehouses, you can add quite a few cranes, a quay for boats and even a small lighthouse if you wish! In just 3′ X 3′ area this gives a lot of action, interesting scenes, and most importantly a good depth that is generally absent from a typical small switching layout. The intriguing part is definitely the wye – and I personally liked the unique shape of it in a relatively tight space and with pretty broad curves. With a little bigger space (6 inches on each side) the central square module can actually become a very interesting switching layout by adding a couple of more siding and/or switchbacks. The layout is not designed keeping any particular era in mind, this can fit in any era and any locale. I used Atlas tracks and switches for the design – #5, #6 and #7 turnouts, but I am sure other manufacturer’s tracks will fit as easily. The biggest challenge for modeling these to the scale is lack of commercially available turnouts, as mostly all commercially available turnouts will be bigger than what it should be – closest could be Peco insulfrog small radius ones. I have designed this with commercially available Atlas number 4 turnouts and tried to keep it as tight as possible. But even with a LOT simplified track design, this can be a very interesting layout in terms of operation and can have visually exciting urban scene. Notice that round freight house in the center which can be a unique structure for this layout. There is a provision on the top left corner to connect this layout to a staging/fiddling yard or to another shelf layout, but please note that like the real transfer facilities, this layout is self sustaining by itself and does not require to be connected to anything. The car float and the round warehouse here depicts the ‘outside world’ – that is car floats bring the loads of cars to the facility, and then they are unloaded at the warehouse. The trucks and road transport vehicles then pick them up from the warehouse and distribute it to their respective destinations. Also cars from other transfer facilities brought in by the car floats can be ‘stored’ temporarily, and then loaded to another car float to be shipped a different transfer facility. Empties from the warehouse need to be loaded to a car float to be taken to back as well. For those who might be interested for more prototypical representation, Tim Warris has made a tremendous layout for Bronx Terminal – and trust me, it’s hell of a project! He has also developed tools for hand laying very complex tracks, especially for the various transfer facilities in New York. Though this layout is designed with Atlas tracks and turnouts and 9-3/4″ minimum radius (which is broad for the prototype) which should be decent enough to run most commercially available switchers in N scale at moderate speed, if you wish to simulate true prototypical operation, the trains need to run at very slow speed on this one – hence I strongly recommend electrofrog turnouts, if you decide to use commercially available tracks and not make your own.